To cite this article please use the following: Dzięgielewski K., Gawlik A., Kienlin T.L., Korczyńska M.M., Mazur M., Przybyła M.S. 2016 Relations between landscape and defensive settlement in Bronze and Early Iron Age Małopolska – preliminary ideas and results, article submitted to the e-past.pl website at http://e-past.pl/relations-between-landscape-and-defensive-settlement/. This article is a modified version of the paper presented at the International Open Workshop “Socio-Environmental Dynamics over the Last 12,000 Years: The Creation of Landscapes IV” at Kiel, Germany, in March 2015. 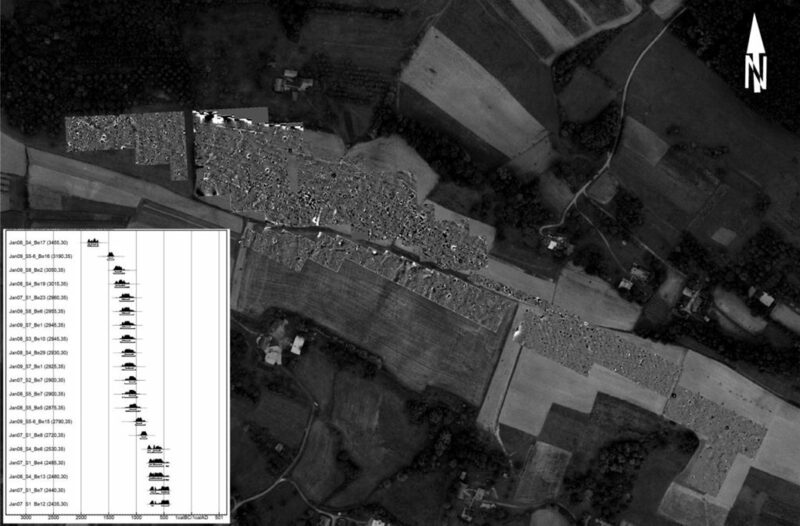 Studying past landscapes (‘anthroposcapes’) in a meso- or interregional scale, one can notice that the presence of fortified settlements in one region does not always entail that neighbouring areas characterized by similar environmental conditions reveal traces of the same type of settlement strategy. The same applies to the social aspect: similarly organised societies under similar circumstances might, but did not have to, build fortifications. Are there, nevertheless, any general preconditions for the emergence of enclosing tendencies, some ‘deterministic trajectories’ that lead to ‘fortified’ strategy? This is the question we try to address within the frameworks of the ongoing research project focused on southern Poland (Inheritance, social network or local adaptation? Bronze and Early Iron Age societies in western Małopolska). A very general idea behind our project has long been discussed in anthropology and is sometimes referred to as the Galton problem. This is the question about the origins of variability of cultural patterns. Is this variability simply an effect of ecological adaptation? And if not, what matters the most: local, vertically transmitted tradition, or free, horizontal transmission between societies regarded as nodes within a communication network? We are going to formulate some answers to the above questions on the basis of archaeologically well-investigated area of western Małopolska in southern Poland, or more precisely on the basis of four regions, which were densely inhabited during the Bronze and the Early Iron Age (fig. 1). The general assumptions of the project and a handful of details were delivered in an introducing paper at this website (Przybyła et al. 2015). 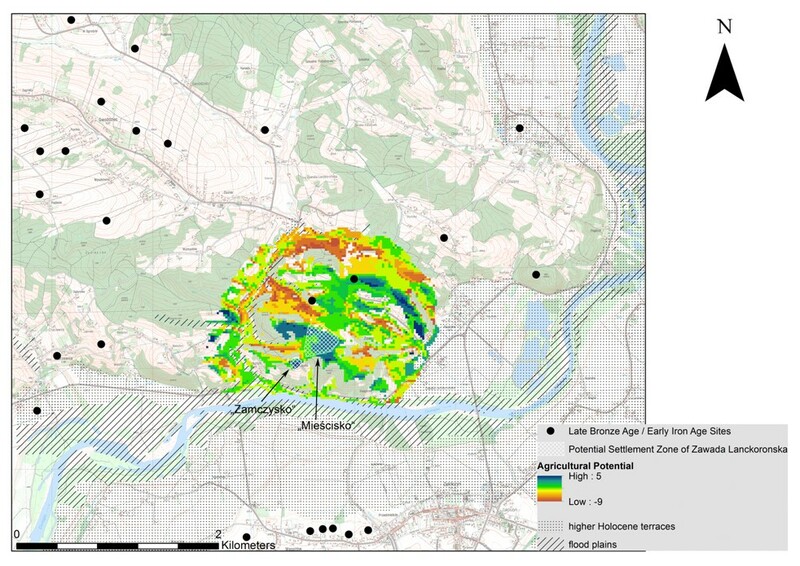 The four test areas are located in different ecological zones, from the Wisła (Vistula) valley to the Carpathians, so they can be expected to reveal different patterns of environmental adaptation. However, people inhabiting these areas probably maintained contact, and we also suppose some elements of independent, (not purely adaptive) local traditions developed in each of the regions. According to a very popular, not to say predominant, point of view, the one strongly associated with the world-system theory, Bronze Age defensive settlements are supposed to have been centres of political power and specialised craft. 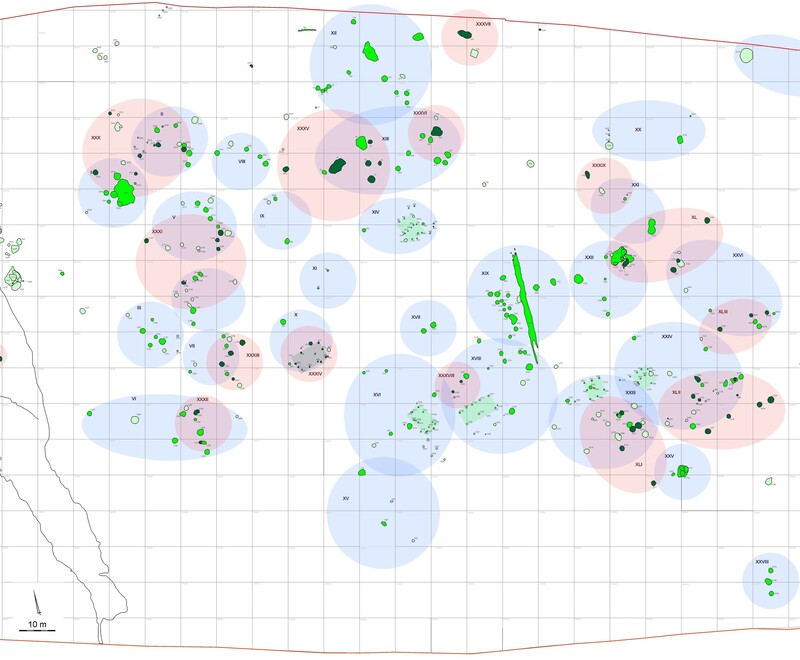 Occupied by elites, these places participated in long-distance exchange and were surrounded by subordinated satellite villages inhabited by autonomous, rural societies. In other words, prehistoric defensive settlements are seen as counterparts of medieval castles. But is this analogy correct? As known from ethnography, one of the most distinct traits of primitive warfare is voluntary participation in violence (e.g. Keeley 1996). This results in a tendency for aggressive warrior parties to be usually inferior in numbers than their potential victims, making an unexpected assault the only reasonable strategy of attack. Naturally, defensive strategies are oriented on avoiding exactly this threat. Therefore, the main features of defensive settlements in preindustrial societies are not the presence of elaborated fortifications (which may be sometimes difficult to trace), but their location and density of buildings. Both factors generate some important costs and therefore must have some functional explanation. open, dispersed villages with “day security groups”, relying on demographic potential and active defence strategy (cf. Przybyła 2014). What are possible functional determinants for these two strategies of defence? Theoretically, unrestricted access to areas of high agricultural potential can be expected to encourage territorial expansion of households, allow for demographic growth of local community, and reduce competition over land, thus favouring the development of open settlements. On the other hand, defensive villages would be promoted in regions marked by strictly limited access to areas of higher agricultural potential and by unequal distribution of resources. Such conditions impose economic limits on the size of local population, make them dependent on the access to communication routes, and weaken their active military power. If no evidence of these preconditions can be found, other factors (social hierarchies, political events) may be taken into account. What kind of evidence can the strategies in question be expected to leave? It seems reasonable to assume that “concentrated” villages would produce large amount of archaeological remains (including so called “cultural layers”) within a small area, while open villages should be characterised by loose scatterings of household remains over a vast area. The models introduced here deserve some illustration, and there are two well-investigated Middle Bronze Age sites in the eastern part of the Polish Carpathians that we can use as an example. The first one is the well-known, strongly fortified hilltop settlement in Trzcinica. The second site is located in Jasło, on a kind of a small island surrounded by swamps. Although archaeological excavation did not uncover any traces of fortification there, a new geophysical survey has revealed a regular arrangement of houses concentrated around the central square. Thus, also in this case we are dealing with the remains of a defensively located and concentrated village. Importantly, both sites are located in close proximity, ca 4 kilometres from each other, which leaves no place for the whole complexes of subordinate villages assumed by the ‘central place’ model. Another example comes from our research area. 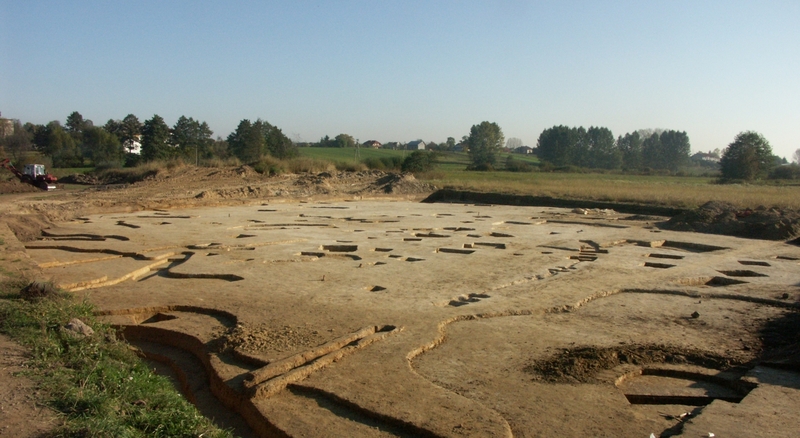 The excavations in Maszkowice, in the West Carpathians (test area 4), have revealed the remains of a quite well preserved multi-layered site from the Early, Middle and Late Bronze Ages (fig. 3, 9). During its oldest occupation phase the settlement was protected by a stone wall holding a clay terrace, which was probably about two and a half meter high (Przybyła 2016). Archaeological material from this period of the site’s occupation displays clear connections with the Carpathian Basin. Every decorated piece of pottery may be classed as typical of the communities from the Tisza region known to archaeologists as the Otomani culture. The wide connections of the Middle Bronze Age population from Maszkowice are also reflected in other ceramic, faience, amber, and bronze objects. In other words, following the world-system theory approach we might expect here an elite site, a centre of political power having special position within a hierarchically ordered settlement network. Nonetheless, after many surveys in the area surrounding the site we have been able to identify several dozen settlement points of the Late Bronze Age or Early Iron Age date, but not a single piece of pottery which might be contemporary with the Middle Bronze Age hillfort in Maszkowice. This means that despite the wide connections the settlement was probably inhabited by a relatively small, rural population rather than a hierarchized one. A quite different situation was noticed in our test area 3, in the Carpathian Foreland (Rożnów Foothills), with the sites at Janowice and Wróblowice being most comprehensively investigated. From the geophysical survey it is evident that the settled area at Janowice is at least 900 m long in NW to SE direction, and some 100–150 m wide in N-S direction (fig. 4). So far, there is only scarce evidence of Early Bronze Age occupation in the form of a single pit, and permanent settlement seems to have started only somewhat later. There may have been some early episodes during the Middle Bronze Age or at the very beginning of the Late Bronze Age, but occupation most likely became more intensive only from Ha A onwards and continued into the Early Iron Age (Kienlin et al. 2010). Thus, Janowice witnessed a continuous settlement for several hundred years. This should not be taken to imply, however, a substantial number of houses co-existing or an imposing aspect of what probably was a loose group of households interspersed with plots for horticulture and livestock. But it certainly implies that there was a tradition and potentially an awareness of the greater antiquity of the households in residence, as compared with neighbouring sites that were not as long-lived and saw more frequent relocation. What is important is that there is no evidence for site hierarchies or significant functional differentiation. In order to show how past communities might structure their ‘resource landscape’ and how they were structured by the landscape themselves, an Agricultural Predictive Model was computed for selected sites located in the West Carpathians. The model was built according to an approach which emphasizes the importance of subsistence economy. It is assumed that the location and long-term existence of a settlement need to be a reflection of the environment capability. In that sense, a shift such as the site relocation should be correlated with the change in resources accessibility (e.g. arable land), or connected with a change in the method of their acquisition, while the emergence of fortifications could be explained by the shrinking of resources around the settlement. Open settlements in Janowice and Wróblowice as well as fortified settlements in Zawada Lanckorońska (fig. 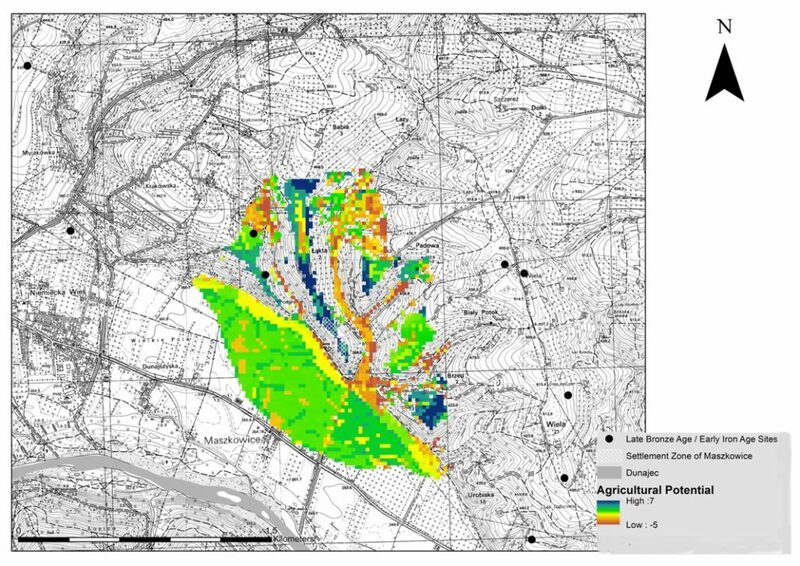 5) and Maszkowice were used in an attempt to model the agricultural potential of the settlement vicinity. To calculate the site exploitation territory a Path Distance Analysis was performed. A catchment area of 15-minute walking distance around each settlement was modelled based on geomorphologic features. To establish this area, the so-called Tobler’s hiking function was used. It presents the relationship between speed of movement and slope, and takes into account obstacles, such as the Dunajec River that may have constituted an important barrier. The sizes of settlements themselves were determined by means of excavations, surface surveys, and geomagnetic prospections. Several factors could have influenced the choice of areas for agricultural activity, the most important among them being geomorphology, solar radiation, soil fertility, difficulty of soil cultivation, and viewshed. 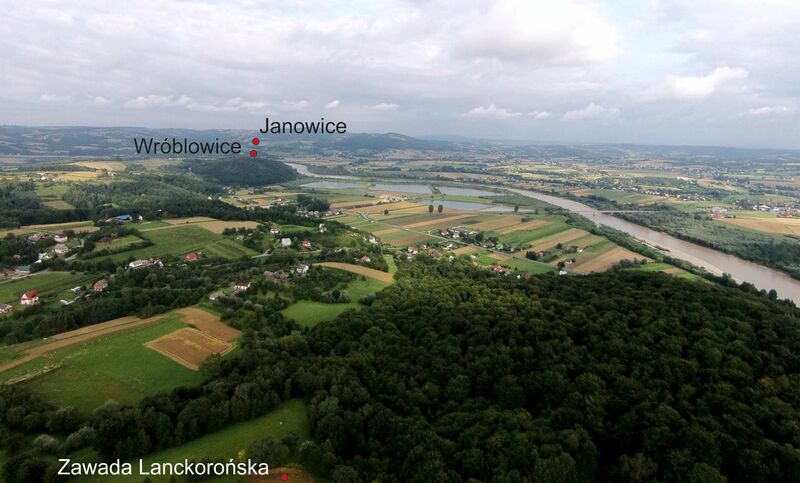 The catchment area of the Janowice settlement amounts to 430 hectares (fig. 6). The exploitation zone consists of a wide stretch of fertile land around the site itself and many scattered patches, situated mostly to the south-west and north-east from the site (altogether 181 ha evaluated between 0 and 9 points). The catchment area at Wróblowice amounts to 286 hectares (fig. 7). The exploitation zone comprises many potentially arable areas. 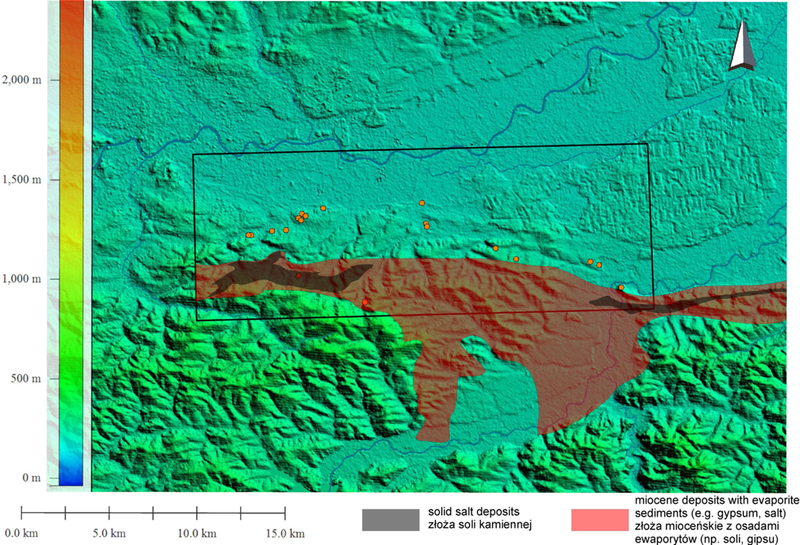 They are located mostly in the immediate vicinity of the site, at the sections of a Holocene flood terrace with a low TWI index and at the south-eastern parts of the catchment zone, altogether 202.5 hectares with values between 0 and 24 points. 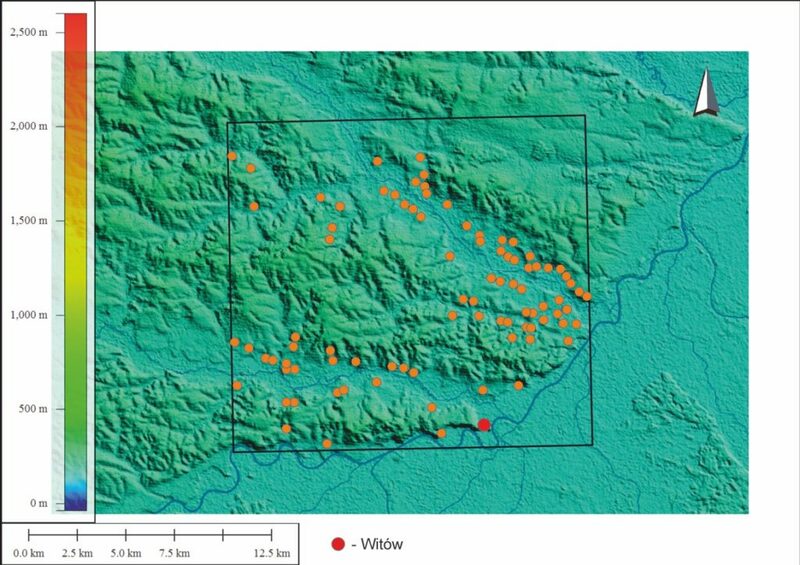 Remarkably, all Late Bronze Age or Early Iron Age sites in the Janowice/Wróblowice cluster capture mainly well evaluated zones. This confirms the importance of environmental variables for the studied communities. The surrounding sites may have had auxiliary character, were short-lived, and either represent more mobile activities (virtually none of them yielded more than a few pottery shards) or are related to specific aspects of agricultural production. The catchment area of the Zawada Lanckorońska fortified settlement amounts to 212 hectares (fig. 8). The potential arable zone reaches ca 98 hectares (46% of the total site catchment area). This value is two times lower than in the case of open settlements in Janowice and Wróblowice. The land ranked as favourable (0-5 points) can be found only in the close vicinity of the settlement in question and in the north-east part of its catchment area. In our opinion, this limited size of the cultivation zone is remarkable in this case and, in connection with the long-lasting occupation recorded in Zawada Lanckorońska, is highly indicative of a different pattern of farming activity. However, this does not mean that the settlement in Zawada Lanckorońska remained in any form of hierarchical relationship with other settlement points of the local group. The same analysis was carried out for Maszkowice (test area 4, fig. 9). 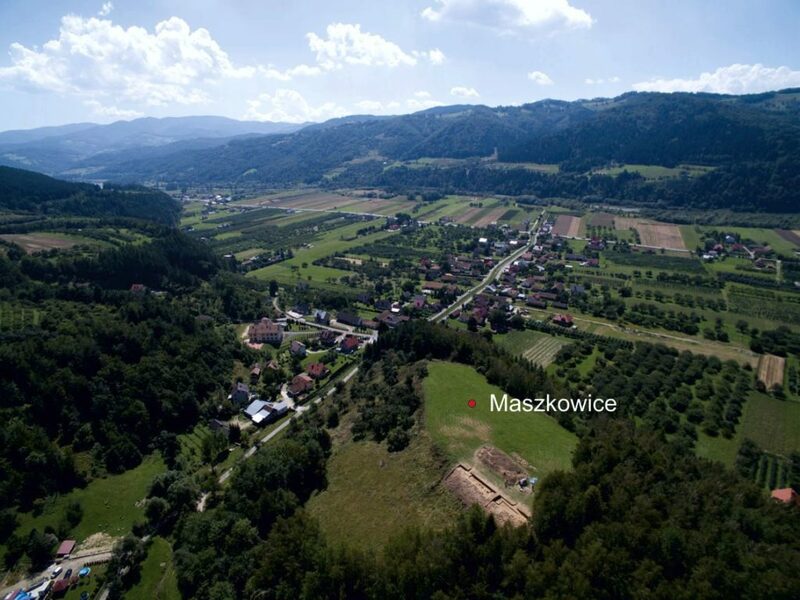 The catchment area around Maszkowice is only 122.6 hectares (fig. 10). However, the arable land (0-7 points) is 105 hectares in size and thus comparable to the level observed in Zawada Lanckorońska. Unlike in the middle Dunajec valley, the potentially most favourable zone is located here mainly on the Pleistocene terrace of the Dunajec River. 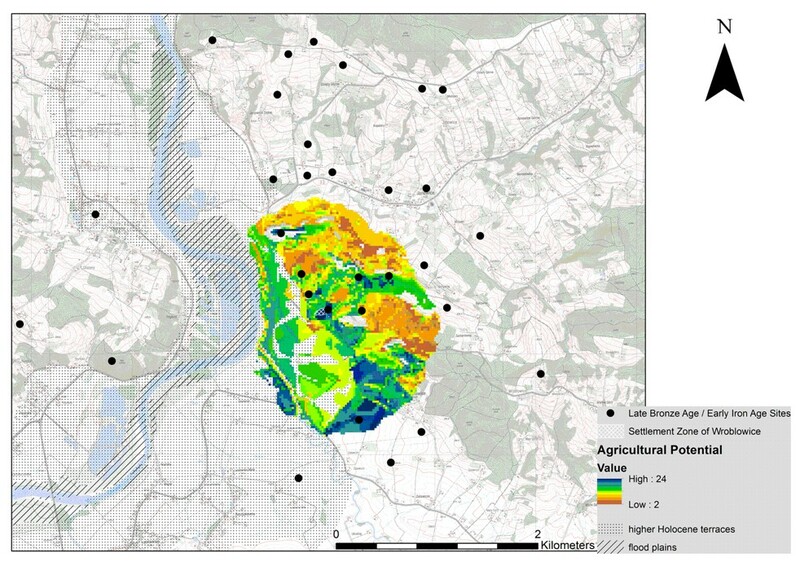 Since the hills around the Łącko Basin have steep slopes (and as such were not suitable for grain cultivation), the location of the Maszkowice site on a hill overlooking the river terrace may reflect an optimal adaptation to local environmental conditions. 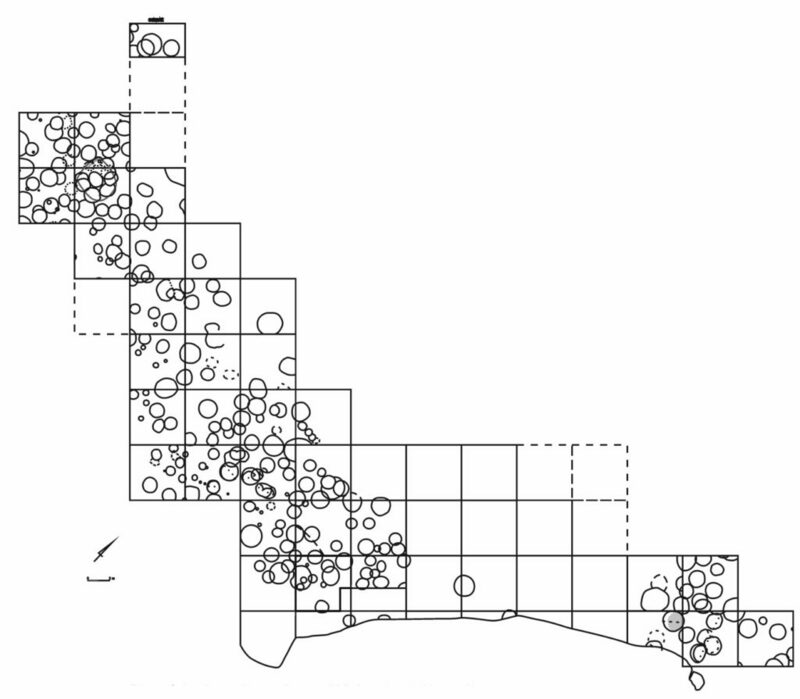 As pointed out in the case of Zawada Lanckorońska, this shows the different spatial distribution of the potential fields. In general, the research has shown diversified subsistence strategies and solutions used by mountain and foothills Bronze Age communities living in similar cultural and natural environments. Moreover, the communities in question were also dependent on other factors which cannot be geostatistically modelled. The expectations derived from the model presented above find confirmation in the third region, of mostly lowland character, located in the western fringes of a vast lowland basin eastwards of Kraków (fig. 1: test area 2). The area is located between the broad Vistula river valley and the Carpathian foothills and its landscape embraces some minor hills (up to 300 m) and wide flood plains of the Vistula’s Forecarpathian tributaries. By and large, the region offers excellent conditions for extensive agriculture. In test area 2, large, open settlements were prevailing during the Bronze and Early Iron Ages and this reflects the availability of vast grazing land within the flood plains and open agricultural land located on easily accessible slopes (fig. 11). Apart from larger settlements there also were smaller sites (or even hamlets) scattered nearby, and the sites were quite regularly dispersed over the area. Within settlements, small translocations of particular households between consecutive chronological stages and constructional phases (fig. 12) document a long-term stability of the model of non-defensive, dispersed occupation in the presented area. Therefore, we can suggest that this strategy was adaptive under local conditions. The availability of resources (arable land, grazing areas) as well as the potential for extending the areas of both habitation and farming in successive generations restrained local communities from making efforts to fortify their villages. This interpretation is also supported by the pattern of exploitation of a unique resource characteristic of the area in question – salt. The region of Wieliczka-Bochnia is well known for its medieval salt mines. The rock salt deposits are very limited in space and were not exploited in the Bronze and Early Iron Ages, but the area of potential salt sources, which might provide brine, is considerably larger, embracing large parts of our test area 3 (fig. 13). Brine evaporation, or at least the use of salt containers, is attested for almost all the examined settlements in the test area. There are three types of sites connected with the evaporation of salt: those which are located directly over salt springs, and yielded huge amounts of very fragmented briquetage forms, mostly in aggregations, with the complex of sites in Kraków-Bieżanów as the prime example. At least some areas within these sites were used exclusively for the production of briquetage and for brine evaporation. Other sites are located in a 2-3 km distance from salt springs, and the limited transport of brine has to be considered there (e.g. Kraków-Bieżanów, site 27 – Kadrow ed. 2003; Kadrow, Nowak-Włodarczak 2003). The third – most numerous – group of the sites are located outside, but very close to, the salt bearing belt (e.g. Podłęże, site 17 – Dzięgielewski 2010; Dzięgielewski et al. 2011). Fragments of briquetage are better preserved and generally less numerous at these sites. Usually, they are evenly distributed within households and therefore document regular use of salt, carried in containers from salt-production sites probably by the very inhabitants of the discussed settlements and not by some “specialists”. The lack of access regulations or any forms of “elite” control over salt springs may be derived from an open character of producing and consuming sites. Test area 3 did not yield any fortified settlement, and only 2 or 3 small presumable hilltop settlements (Biskupice, Góra Chełm, Kopaliny) of natural defensive location are to be mentioned from the area of the Carpathian foothills adjoining directly from the south. The “controlling” role of these sites over salt bearing area is doubtful due to the scarcity of metal finds and other material indicators of gains from salt production. Their hilltop location is rather an adaptive feature in more elevated landscape. Unrestricted access to this resource may also be suggested by even distribution of two different pottery styles in a 12th century BC settlement in Brzezie. The early Urnfield “Silesian” vessels were accompanied there by vessels representing the Transcarpathian “Belegiš II” style (fig. 14). The evidence for each of these pottery traditions was found together in many households, also within those with briquetage accumulations. Therefore we can suppose that the creators and users of both pottery groups (one of them allegedly newcomers) had equal rights to exploit local salt springs. None of the discussed sites provided evidence for the emergence of vertical hierarchy related to the access to the salt springs. Neither settlements nor cemeteries in test area 2 differed much in this respect from those in other areas, e.g. from the loess upland (test area 1). What is more, the cemeteries of the ‘lowland’ communities were usually smaller and more poorly furnished than those belonging to typical farming groups from western Małopolska uplands. Site 1 in Witów, situated in loess upland approximately 60 km east of Kraków in test area 1 (fig. 1 – test area 1; Gawlik, Godlewski 2006; 2009), clearly stands out against the above background. Both in the area encompassed by the project research and elsewhere, Late Bronze Age (the Lusatian culture) settlement concentrates on river terraces, for example in the valleys of the Vistula, Szreniawa, and Nidzica rivers (fig. 15), and the same applies to Witów as well. However, being situated on a distinct promontory with steep slopes flanking three sides and accessible only from the west, the site can also be regarded as a naturally defensive location. Furthermore, such a location is a perfect viewpoint, offering visual control over the broad valley of the Vistula, the valley of the Szreniawa, and the neighbouring hills. The settlement space is naturally confined there, as is also the land accessible for farming, which is limited to the fields to the west of the promontory. 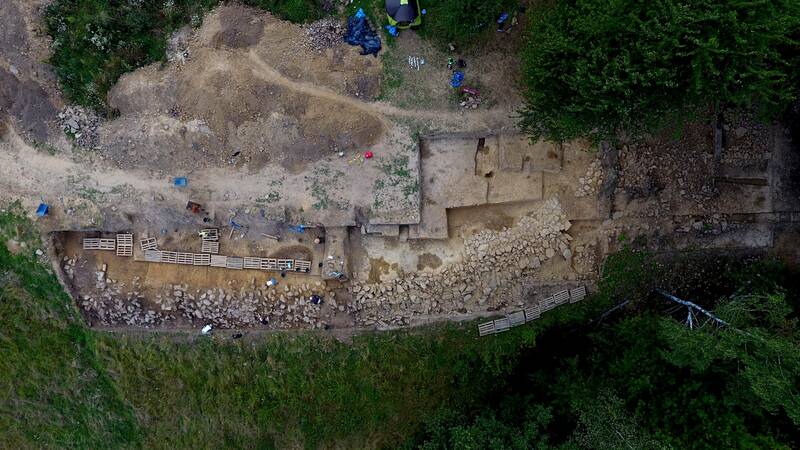 The settlement most likely encompassed the entire area of the promontory, which is evidenced by the fact that excavations conducted in five different places always resulted in the discovery of a large number of Lusatian culture features. The proportion of the number of features to the explored area suggests that we are dealing here with very intensive occupation (fig. 16). The Lusatian culture pits in Witów date within a broad period spanning from ca 1350 BC to 650/620 BC, and features from particular chronological phases do not concentrate in the same place (fig. 17). What makes Witów unique is not only the saturation with features and materials, but also the presence of fortifications in the form of earth-and-timber rampart (fig. 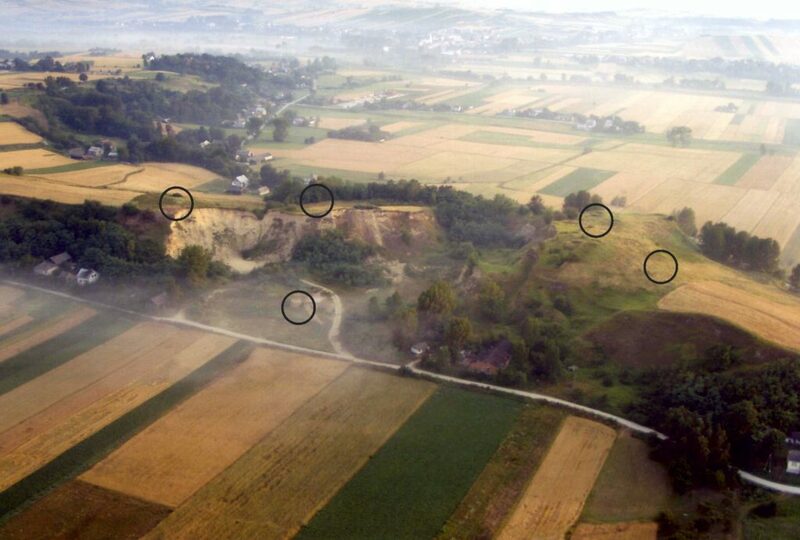 18), although the line of fortifications cannot be fully reconstructed due to the considerable destruction of the site. 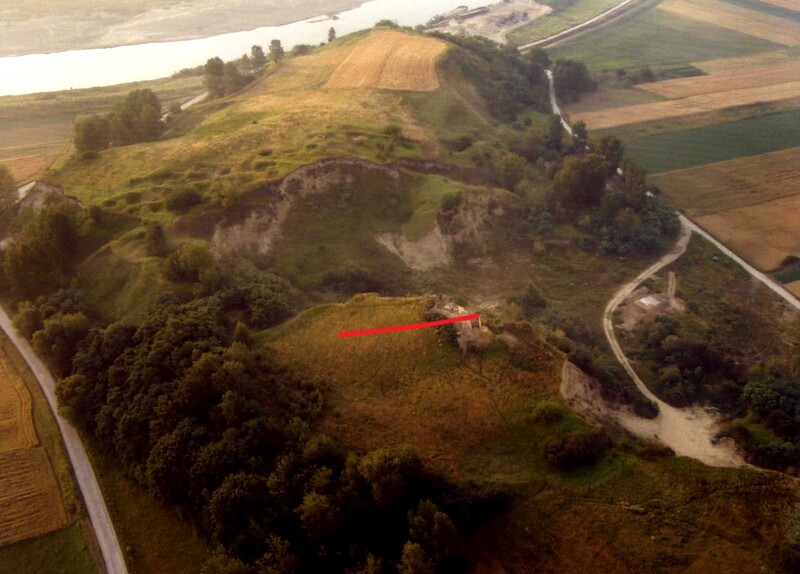 Most likely, the rampart cut the eastern part of the promontory off from the rest of the site (fig. 19). Pits dug into the embankment from the inner side of the stronghold and the discovered pottery indicate that the fortifications were erected at the transition between the Bronze and Early Iron Age. The 4-meters high rampart crowned with a structure supported by large posts finds no direct analogies in western Małopolska; in fact, it is the only known Lusatian culture (LBA/EIA) stronghold in the region. However, striking similarities can be shown in the Late Bronze Age strongholds of the Silesian group of the Lusatian culture. The rampart construction has the best parallel in the stronghold in Łubowice in Upper Silesia, on the Odra River (Chochorowscy 2008), some 190 km from Witów. The similarities go so far that one could risk calling the Witów rampart an exact imitation of the one from Łubowice. One of the goals of the presented project is to explain the reasons behind the adoption of such and no other settlement strategy by the people inhabiting the Witów promontory. If we assume that from the very beginning they followed the pattern of clustered settlement, then the construction of fortifications would be seen as a natural, evolutionary development of this strategy. But why is this model observed only in this one site? Was it forced by the specific landform? Economic and environmental factors operating on other settlements in the region were the same, but they produced different outcome in terms of settlement pattern. It is worth noticing that the early Lusatian culture in the Kraków region showed much similarity to the territory of Silesia, for example in pottery style, settlement patterns, etc. By the Late Bronze Age these Silesian influences become generally less noticeable in Małopolska, but in Witów they continue and can still be observed in ceramic style. The contact between the two regions is emphasised by the striking similarity of the rampart form. Therefore, the presence of fortifications in Witów should perhaps be linked with personal/political connections rather than economic or social factors. isolated fortified settlement appeared in Witów, within fertile loess upland. 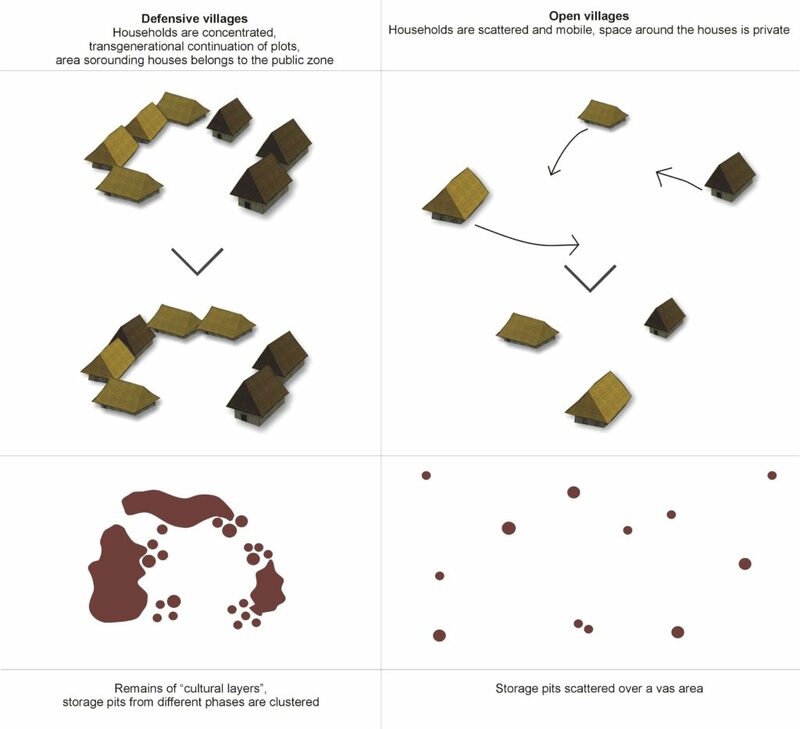 Our working hypothesis is that in some cases Bronze Age defensive villages may have been basic units of rural settlement networks and not places occupied by interregional elites. The evidence from the Middle Bronze Age in the intermountain Carpathian valleys apparently supports this thesis (the only form of settlement here seems to be the defensive one). 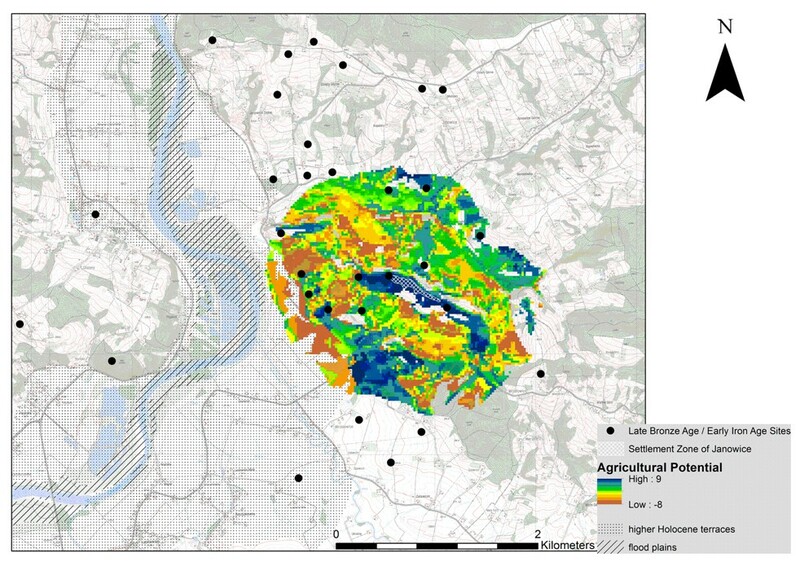 Palaeoeconomical studies carried out for some microregions along the Dunajec valley (West Carpathians) show that unequal and limited distribution of economically important resources (here: the arable land) may have been an important factor stimulating the emergence of defensive settlement. However, outside mountainous regions other factors, social (emergence of wealth inequality) or political, might have influenced the erection of fortifications or the choosing of defensive locations, as perhaps was the case with Witów. On the other hand, easily accessible resources, even as unique as salt, did not foster the enclosing tendencies. A decision to build fortification, and to live behind the wall, was taken on the very local level and probably only when the ‘open strategy’ was being considered too dangerous by most of the community members. Such decisions were taken not only, and not everywhere, on security grounds, but were closely linked with social signalling as well. Chochorowscy E. and J. 2008 Łubowice. Pradziejowa warownia nad Odrą, Alma Mater. Miesięcznik Uniwersytetu Jagiellońskiego 99/2008 (special issue): 106-112. Dzięgielewski K. 2012 Brzezie 17, gm. Kłaj, woj. małopolskie. Tom II. Epoka brązu. Część 2. Osada kultury łużyckiej z młodszej i późnej epoki brązu, Kraków (unpublished monograph in the archive of the Cracow Team for Archaeological Supervision of Motorway Construction, Kraków-Branice). Gawlik A., Godlewski P. 2009 Rescue excavations at site 1 in Witów, Proszowice district. Seasons 2004-2005, Recherches Archeologiques NS 1: 83-99. Kadrow S. ed. 2003 Kraków-Bieżanów, stanowisko 27 i Kraków-Rżąka, stanowisko 1. Osada kultury łużyckiej (Via Archaeologica. Źródła z badań wykopaliskowych na trasie autostrady A4 w Małopolsce), Kraków. Kadrow S., Nowak-Włodarczak E. 2003 Osada kultury łużyckiej na stan. 27 w Krakowie-Bieżanowie – organizacja warzelnictwa soli, (in:) J. Gancarski (ed. ), Epoka brązu i wczesna epoka żelaza w Karpatach polskich. Materiały z konferencji, Krosno, 549-567. Keeley L.H. 1996 War before civilisation. The myth of a peaceful savage, New York-Oxford: Oxford University Press. Kienlin T.L., Cappenberg K., Korczyńska M., Przybyła M.S., Valde-Nowak P., 2010 Peripherie oder Kommunikationsraum? Siedlungsarchäologische Untersuchungen im Vorfeld der polnischen Westkarpaten (Wiśnicz-Hügelland und mittleres Dunajectal, Kleinpolen), (in:) B. Horejs, T.L. Kienlin (eds), Siedlung und Handwerk – Studien zu sozialen Kontexten in der Bronzezeit. UPA 194, Bonn, 191-268. Korczyńska M., Cappenberg K., Kienlin T.L. 2015 Lauter Lausitzer Burgwälle? Zur Bedeutung landwirtschaftlicher Gunstfaktoren während der späten Bronzezeit und frühen Eisenzeit entlang des Dunajec, (in:) J. Gancarski (ed. ), Prehistoryczne osady obronne w Karpatach Polskich, Krosno, 215–244. Przybyła M.S. 2014 Teoria ewolucji w archeologicznych badaniach nad dawnymi społeczeństwami (Prace Archeologiczne 67), Kraków: Profil-Archeo. Przybyła M.S. 2016 Early Bronze Age stone architecture in the Polish Carpathians, Archäologisches Korrespondenzblatt 46/3: 291-308. The first step in calculating the model was the development of a spatial cross-correlation matrix in order to identify potential autocorrelation between the variables. Due to a strong positive correlation between altitude, slope and access to water, the three variables were excluded from further calculations to avoid statistical redundancies. At the next step solar radiation and all non-ratio scaled variables were evaluated on the ordinal rating scale. The evaluation was made in the deductive way, based on the hints known from experimental archaeology and common notions concerning the land use in the Bronze Age. In order to calculate a raster, the Topographical Position Index (TPI) was first calculated. This parameter enables identifying six basic geomorphological units based on Digital Elevation Model. The origins (Pleistocene or Holocene) of geological formations were also taken into consideration. Due to the Holocene chronology of the fluvial terraces in the middle course of the Dunajec, and therefore a possibility of seasonal floods, this area was generally interpreted as unfavourable for agriculture. Therefore, for this area an additional analysis based on the Topographic Wetness Index (TWI) was calculated. TWI describes the spatial distribution and determines wetness at the surface. As a result, the areas within Wróblowice flood terraces and at the same time characterized by the low TWI were excluded from the model. Afterwards, the difficulty of soil cultivation was assessed, which was based on soil types and slopes degree. Slopes over 12° in loess areas, and over 15° in the case of other soils, were excluded from potential agricultural activity. This decision was based on the results of studies of water erosion in modern times which show that this type of erosion tends to accelerate very rapidly on slopes steeper than 10-12°, making the tillage activity on such grounds almost impossible. Then, the direct solar radiation was calculated on the basis of the present-day vegetation period. This factor was included since crops cultivation is traditionally connected with the well-lit areas. Next, soil fertility was included since different palaeobotanical data gathered from Late Bronze Age sites show that cereals probably grew on relative rich habitats. Finally, the visibility (viewshed) from the estimated settlement’s area was incorporated in the model. This factor may be understood as a social variable, which illustrates the possibility of property’s protection, in this case the protection of potential parcels. Finally, the evaluation of all factors was standardized and all raster cells were summarized. The aim of this model was to provide some general hints since there is no certain information about the location of prehistoric fields in the western part of the Polish Carpathians.